The versions of the Nieuport Ni.28 featured in WW1 Wings of Glory Airplane Packs are fighters used by three aces: Edward Rickenbacker, the American “Ace of the Aces” (26 victories); Harold Harney (7 victories); and Ralph O’Neil (5 victories). Following the article about the Nieuport Ni.28, let’s learn more about these brave pilots. 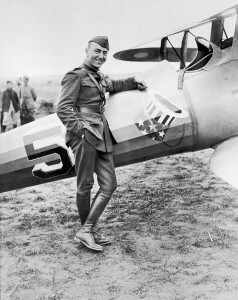 Edward "Eddie" Rickenbacker, the highest scoring US pilot in World War I, was born in 8 October 1890, in Columbus, Ohio. A son of Swiss immigrants, he quit school at age 12, when his father died, to support his family. 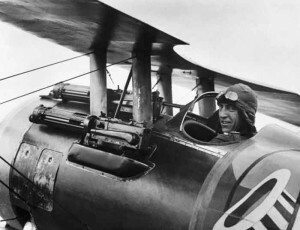 Rickenbacker on board his aircraft. Rickenbacker enlisted in the US Army in 1917, when the United States declared war on Germany. He suggested to the Army they create a flying squadron formed by race car drivers, but he was ignored. He trained with some of the first American troops, and then deployed to France on June 26, 1917, as a Sergeant First Class. He wanted to become a pilot, but was assigned to serve as a driver for the Army general staff. His lack of academic skills and his age – he was 27 – hampered his pilot training. He didn’t resign and when he had the chance to fix the car of Colonel Billy Mitchell, then chief of the Army's Air Service, he let the Colonel know about his interest. His mechanical skills led him to become an engineering officer, and then he persisted until be permitted for flight training. 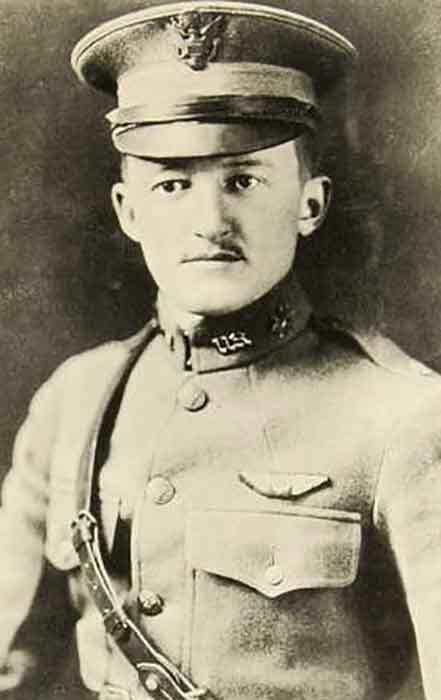 In March, 1918, he was assigned to the newly formed 94th Pursuit Squadron, which included: James Norman Hall (of the Lafayette Escadrille), Hamilton Coolidge, James Meissner, Reed Chambers, and Harvey Cook. A smiling Rickenbacker, close to his airplane. After many strafing missions and fruitless sorties, on a wet April 29th, he and Capt. James Norman Hall had the afternoon alert. At five o'clock Captain Hall received a telephone call from the French headquarters at Beaumont stating an enemy two-seater machine had just crossed the lines, flying south. Hall and Rickenbacker jumped into their seats and the mechanics twirled the propellers. Deciding not to wait for the Major, Captain Hall ordered the blocks pulled away from the wheels, and their motors roared as both machines ran rapidly over the field. Hall led them up toward the sun, gaining an advantageous position over the new Pfalz fighter he had spotted. Coordinating skillfully, Rickenbacker cut off the German's retreat while Hall dived at him, from out of the sun. As the German tried to escape eastward, Rickenbacker opened his throttle and was on him. At 150 yards he pressed the triggers and the tracer bullets cut a streak of living fire into the Pfalz's tail. Raising the nose of his airplane slightly the fiery streak gradually settled into the pilot's seat. The Pfalz swerved, out of control. Lt. Eddie Rickenbacker had brought down his first enemy airplane without taking a single shot! 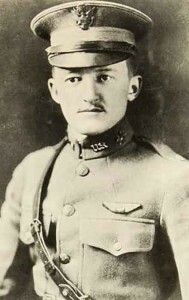 After Hall's capture, Rickenbacker became the new commander of the squadron and scored his second victory while flying with Reed Chambers. Flying over an airdrome at Thiaucourt, he noticed three Albatroses taking off, and dove at 200 MPH. He fired a long ten-second burst, until, at 50 yards range, the Albatros pilot was hit. His plane was damaged and he had to re-start his engine, but he pulled out at about 2,000 feet, landing safely with a new victory confirmed. 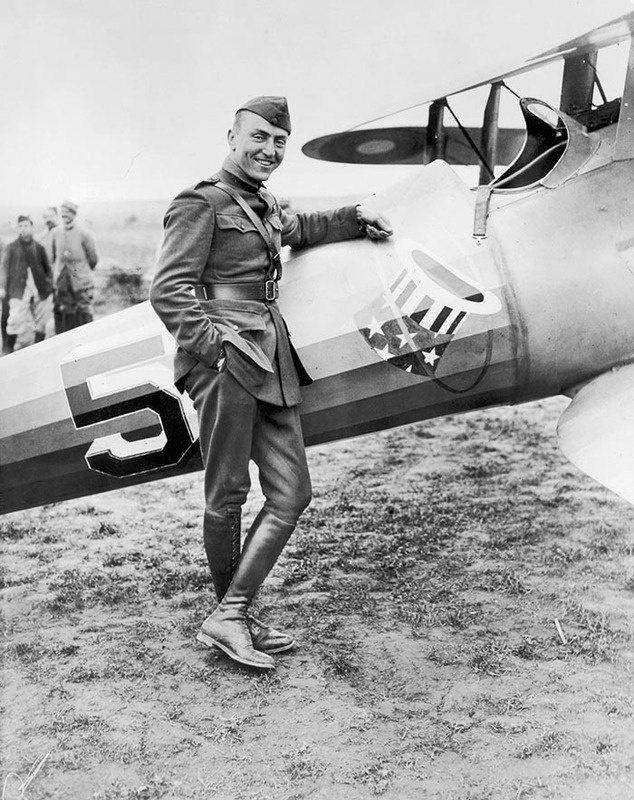 Eddie Rickenbacker, dressed in uniform, stands next to his World War I plane in a field near Toul, France. During the next five months, Rickenbacker hit many enemies, switching from a Nieuport to SPAD, leading the 94th Squadron to glory through the French skies. Flying with his pilots he gained glory and victories for his country and his allies, surviving pneumonia, which lead him to hospital in to recover. As commander of the 94th, nicknamed the "Hat in the Ring" Squadron, he displayed the managerial skills, which served him so well in later endeavors. He drove his men hard and demanded results. They rose early for calisthenics; inspections were frequent and detailed; waste was not permitted. Rickenbacker insisted: “Every plane must be ready to take-off any moment, day or night, guns loaded, gassed, engine tuned. If all was not correct, the war could be lost”. Twelve years after the war ended, he was awarded the Congressional Medal of Honor for his accomplishments. During World War II, he carried out special assignments for Henry Stimson, the Secretary of War, flying in the Pacific in a B-17. After the war, he became a spokesman and advocate for conservative causes, convinced that government "socialist" programs were ruining the country. He died in 1973. Hartney was born in Pakenham, Ontario, Canada, on 19 April 1888. He graduated from the University of Toronto in 1911 and some three years later took his law degree from the University of Saskatchewan. During his student days at the latter institution, he served as a lieutenant in a Canadian military unit, the Saskatoon 105th Fusiliers. Hartney, a great ace who established important training concepts for the pilots. Shortly after the outbreak of the war, the 105th was mobilized. In May 1915, it was sent overseas as a part of the 28th Battalion, Canadian Infantry. Although recently married, Hartney eagerly accompanied his men to England. Much to the dismay of the Canadians, further training was required before they were transferred to the battlefields of France. It was during this period Harold Hartney witnessed one of the early Zeppelin raids on the English countryside and was “bitten by the flying bug.” Hartney visited an aerodrome near Folkstone and had a chance to meet William Bishop, handing him his request for transfer to the Royal Flying Corps. After a wait of several weeks, it was accepted in October 1915. Training on Maurice Farmans (both “Longhorns” and “Shorthorns”) and FE-2B pushers, Hartney made rapid progress toward becoming a full-fledged pilot. However, in January 1916 he was felled by rheumatic fever and spent the next several weeks in a British hospital. 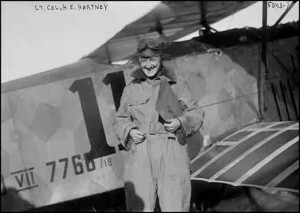 After still further rest under the watchful eye of his young wife Irene, who had arrived in England in the autumn of 1915, Hartney returned to flight training. Upon completion of his training at Norwich, the impatient young Canadian was posted to the RFC’s Number 20 Squadron, then flying FE-2Bs on the Western Front. During the next several months, Hartney participated in many photographic and bombing raids and chalked up five aerial victories over German aircraft. On 14 February 1917, while photographing enemy positions near Ypres, he was shot down by enemy fighters. Although Hartney was able to crash-land in friendly territory, he sustained severe injuries and was invalided to England, where he spent seven months recuperating. Upon returning to duty in September 1917, he was transferred to the United States, with the rank of major, and ordered to take command of the 27th Aero Squadron, then training in Canada. After the transfer to Texas, the seasoned, hard-driving Hartney whipped the squadron into battle shape. Convinced hundreds of hours of simple “banks and turns” were of little value, the major drove his pilots through one emergency situation after another, such as mock combat, acrobatics, and forced landings. In February 1918, after some five months of rigorous training, the 27th Aero embarked for Europe. Hartney in front of of a captured Fokker D.VII. On 1 June 1918, the 27th joined the 94th and 95th Aero Squadrons at Toul. These units, plus the 147th, which arrived at the front at approximately the same time as the 27th, made up the 1st Pursuit Group, America’s only pursuit group in combat at the time. Under Major Hartney’s aggressive leadership (he scored his sixth victory in June), in the Toul operation and the Château-Thierry campaign, the 27th became the hottest pursuit squadron in the American Air Service. Hartney protested vigorously when the group changed to Spad XIIIs from the maneuverable little Nieuport 28s, saying “The thing flies like a bloody brick, you know.” However, Billy Mitchell and the Air Service seemed to hold no grudges. On 21 August, Hartney, soon to be a lieutenant colonel, was appointed commander of the 1st Pursuit Group — a position he was to hold until the end of the war. Believing strongly combat squadrons should be commanded by active flying officers, he practiced what he preached while leading the 27th. Even after he became a group commander, Hartney continued an active combat role. For this and his behavior, Hartney was respected by all his fighter pilots. He handled, with equal effectiveness, the steady orthodox fliers and the wild undisciplined Frank Lukes. Following his example, all his squadron commanders — Rickenbacker, Meissner, Alfred Grant, David Peterson, Jerry Vasconcelles, and others - continued in fighting roles. He died, age 57, in Washington, D.C. from heart disease. Ralph Ambrose O´Neill was born in Durango, Mexico on Dec. 7, 1896, to an American father and a Mexican mother. He joined the United States Army Signal Corps in August 1917 following a year of study at Lehigh University. 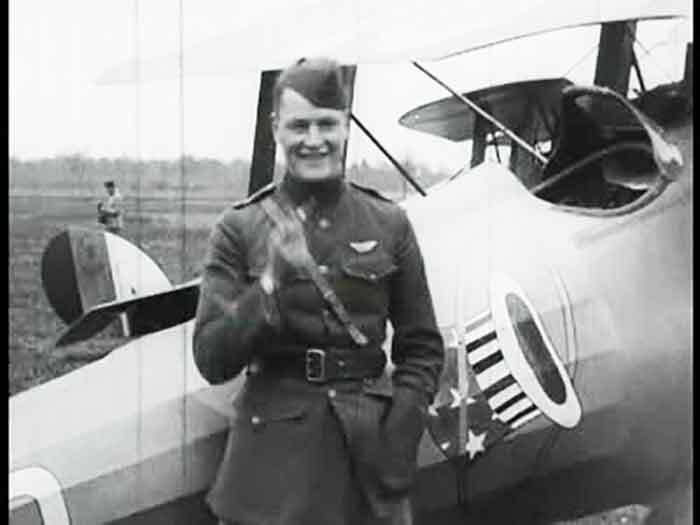 Upon completion of his flight training with the Royal Flying Corps at Ft. Worth, Texas, he was assigned to the 147th Aero Squadron flying the Nieuport 28 and the SPAD XIII. The unit reached France in the spring of 1918, where they completed advanced pilot training at Issoudun. The squadron was posted to the front in May 1918, initially flying Nieuport 28 scouts and switching to the SPAD XIII in August. Adopting the Rat Terrier as their squadron insignia (with the slogan “Who Said Rats?”), the 147th Aero battled seasoned German fighter units over the Chateau-Thierry, St. Mihiel, and Argonne sectors, more than holding their own in those significant offensives that ultimately drove the Germans from French soil. July 1918 was Ralph’s month – he downed as many as six enemy aircraft in four separate engagements. Though only four victories were ultimately confirmed, by month’s end he was widely heralded as one of America’s first aces. 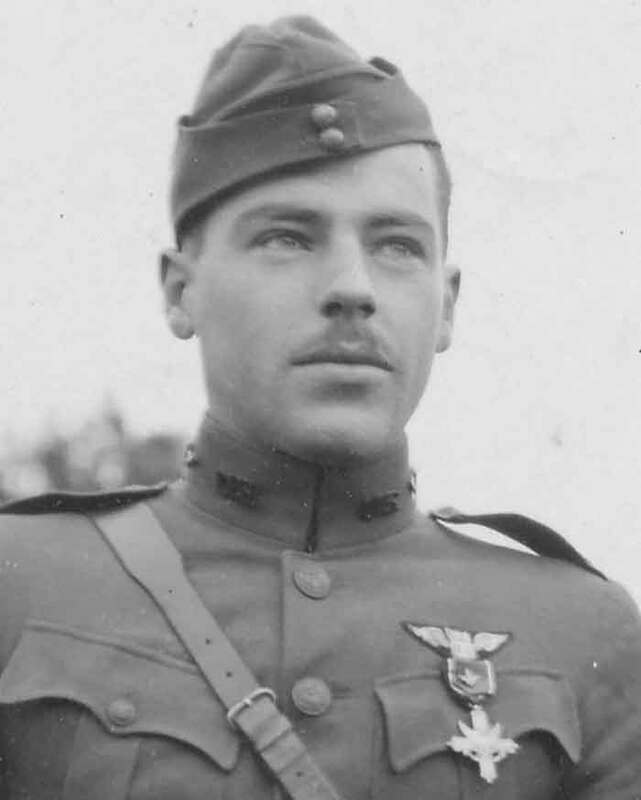 By the end of the war, O’Neill had risen to the rank of First Lieutenant and Deputy Flight Commander of “B” Flight, logging 103 patrol missions (more than any pilot in the squadron) and was officially credited with five victories along with several more unconfirmed. He was the most decorated pilot in the squadron, being cited for extraordinary heroism in action on three separate occasions. He received three Distinguished Service Crosses (America’s second highest award for valor and one of only eight U.S. servicemen in the entire war to be awarded as many) as well as the French Croix de Guerre with Palm. O'Neill, a decorated Ace of the WW1. 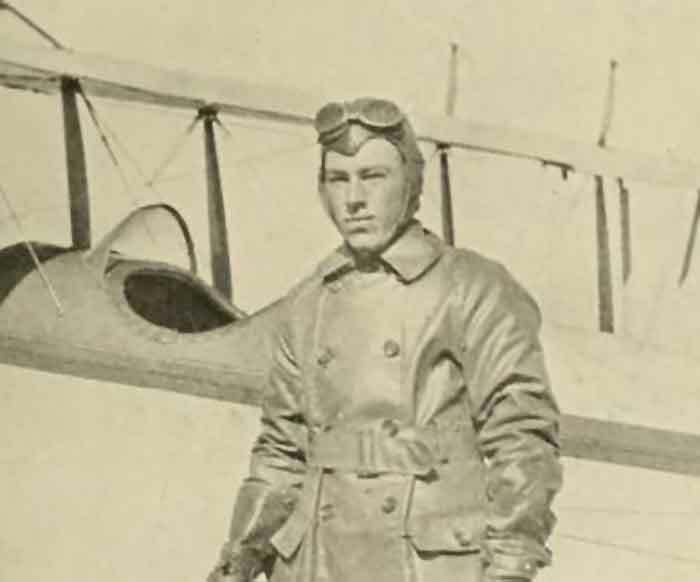 Interestingly, O’Neill was also a recipient of the so-called “Tilton” prize (a private cash award of $2,000, sponsored by the Paris edition of the New York Herald) for being recognized as one of the first five American pilots to down three German aircraft while exclusively flying for the U.S. Air Service. After the war, he returned to the United States and began a career in civil aviation. From 1920 to 1925 he worked under contract for the Mexican government organizing and training a modern air force. In 1927 he became the sole Latin American representative for both Boeing and the Pratt & Whitney Aircraft Company. In 1929 he founded and headed the New York, Rio, Buenos Aires Line, about which he wrote in his 1973 book, "A Dream of Eagles." O'Neill was buried with full military honors at Holy Cross Cemetery in Menlo Park, California. He is a member of the OX5 Aviation Pioneers Hall of Fame and was inducted into the Arizona Aviation Hall of Fame in the spring of 2012. Information sources: The Aerodrome, The Early Birds of Aviation, Inc., Militarian, CAF Airpower Museum, Wikipedia, AcePilots.com, Daily Mail, Stock-clip.com, Britannica.com, This day in Aviation, Commemorative Airforce Airbase Arizona.